I know I keep writing it’s been awhile, and then I take yet another hiatus. Then I don’t explain fully…why I’m not blogging regularly. While some readers that are also twitter followers know (and since it’s SO close what’s the harm really…) I guess I’ll out myself, even though I hate doing stuff like this especially on Facebook but… there will probably be another blogging hiatus as I adjust to life with two kids. That’s right, you read that right. No later than next week, Zara’s Hungry will become Zara +1 is Hungry. Although little bee will not be quite as hungry as Z. Since this pregnancy has been anything but a fairy tale (but both of us now healthy and happy! ), blogging and cooking has taken a backseat. This morning I wanted to give you a snapshot of some of the gross amazing ness that I’ve been consuming with regularity. 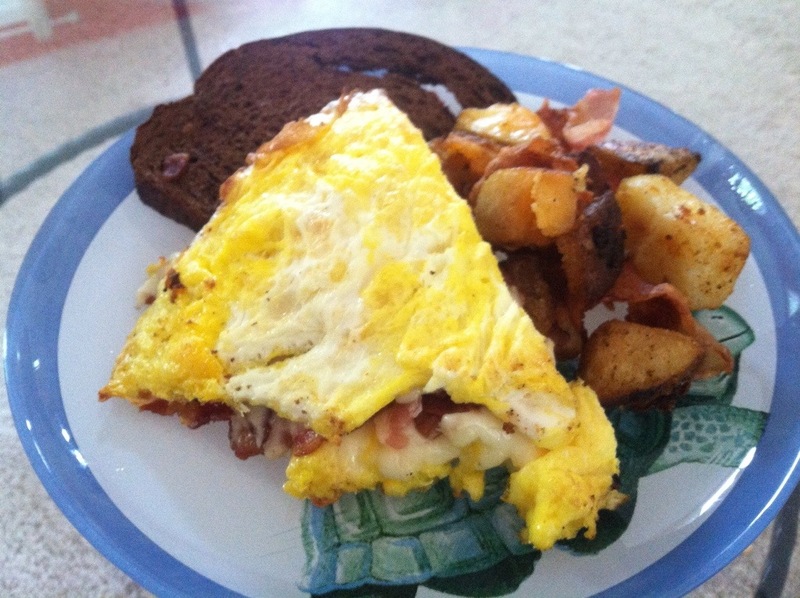 This is a bacon-cheese omelet with potatoes and toast. As it was cooking I was literally drooling into the pan. I’m not sure if this is the hormones or this is really as fantastic as my stomach is telling me it is, but it was pretty fantastic. Happy Thursday. The last day my child is in preschool and I can eat by myself-eek! !